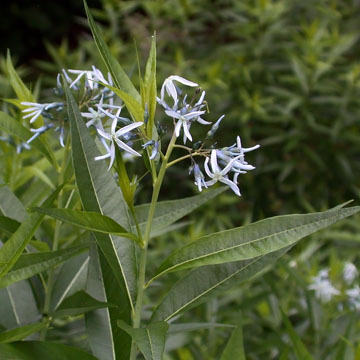 Amsonia tabernaemontana (Eastern Bluestar) | Plants of the Northeastern U.S.
Coastal plain from NJ south (naturalized north to NY and parts of New England), widespread in the south, and north in the interior to southern IN, central IL, and KS. Herbaceous perennial; stems erect, 40-100 cm; leaves thin, dull, narrowly lanceolate to ovate or broadly elliptic, 8-15 cm, acuminate, finely hairy or glabrous beneath; cymes flat to pyramidal, many flowered; calyx glabrous; corolla tube 6-10 mm, villous, especially distally; corolla limb 1 cm wide; fruit cylindric, erect, 8-12 cm. Frequently cultivated and possibly native only as far north as VA, IN, and IL.